Sorry, bartenders. Despite your magic tricks, your skewers of shrimp kabobs and your lemon wheels, you can’t convince me that the best part of a Bloody Mary is the garnish. I know differently. 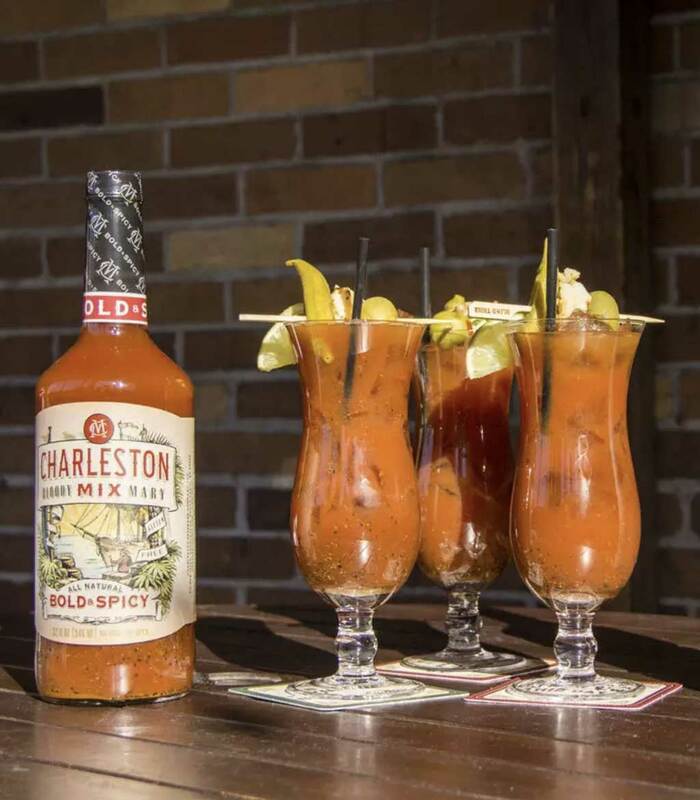 I live in Charleston, South Carolina, and Charleston is the home to four—yes four—locally produced Bloody Mary companies. Despite what this says about our hair-of-the-dog hangover habits, it nevertheless begs the question “Whyever on earth why (read in your mind’s Southern accent)?” Just like a good Bloody Mary filled with spices and garnished with a simple pickled okra, the answer is a little murky, but it has to do with good tomatoes, perfect pairings with Lowcountry food, and of course, the tendency to entertain friends, no matter the time. The first factor is that the South Carolina Lowcountry knows what a good tomato tastes like, and there’s often a few extra laying around during the season. That’s because the soil is well-suited to tomatoes, and the whole region has been known for tomato farming for generations. The heydey for large scale tomato farming on Johns Island has passed, but farmers such as Pete Ambrose and Joseph Fields still grow various varieties of the veg, and you’ll see their names pop up on many a restaurant menu. They don’t commercially can their products, but since the operations Shields mentioned usually involved canning, it’s easy to see how historically Charleston residents would have easy access to already-processed local tomatoes, and that’s really only one step away from Bloody Mary mix. White says that it is just tradition to serve Bloody Marys for an event, depending on the time of day, “because some people want a big drink instead of a mimosa. But the worst thing is to get a Bloody Mary that hasn’t been seasoned at all.” The richness of many Lowcountry brunch foods—including those biscuits—needs a well seasoned, acidic cocktail to balance it. “I like mine with a lot of lemon and black pepper,” she says. And finally, the entertaining and cocktail culture has been a part of Charleston for hundreds of years, and that means there is often a need for a reviver, such as it were. In the early 2000s, Zing Zang ruled the Charleston roost, quickly becoming the go-to for home and restaurant service. According to Food & Drink International, “When Zing Zang started, the product was used a lot in the tourist areas of Florida, Mississippi, New Orleans and South Carolina. [Creator Richard] Krohn built the company’s website, www.zingzang.com, so tourists would be able to find the product when they went home.” Charleston drank it with the tourists and at home too, and one Sunday morning, Charleston Mix’s Ryan Eleuteri went looking for the stuff after a late Saturday night. “Charleston Mix started, I’m sad to say, because of a hangover,” he says. “My store was out of Zing Zang. There was nothing but the other brands I didn’t want.” So he returned home and still a little fuzzy-headed, concocted a recipe that was good, good enough to get the Sunday back on track. Charleston Mix Bold & Spicy. Deep and dank with habanero mash spice instead of horseradish, this one is decidedly not vegetarian, but it is decidedly delicious. If you’re going for a Maria vs. a Mary, then this is the one to choose. Fat and Juicy Original. Straightforward and classic with lots of veggie flavor, it’s a crowd pleaser so perfect for tailgating. I had my first and Juicy Bloody Mary years ago in a red solo cup, so that makes sense. It also makes a mean michelada. Mr. Jimmy’s Pick Me Up Fire Roasted. Creator Jimmy Hagood has been a fixture on the food scene here since his days making barbecue on the Big Red Rig, but he didn’t name this this for himself, but for this grandfather. Either way, it’s made with classic ingredients, clam juice, and a little peach hot sauce for a sweet to the smoke. Natural Blonde Bloody Mary. Made with Valencia Gold and Carolina Gold tomatoes, this one was born after the Cooper River Bridge Run in 2012 (a classic Bloody Mary occasion) when creator John Aquino won a contest with the recipe. It’s fresh and bright. On the other hand, if you’d like to try your hand at making your own Charleston version, Matt and Ted Lee, Charleston natives and well-known authors and cooks, are the home-cooking evangelists to look toward. “We tend to encourage people to personalize, to make their own (the foundation of ours is pretty textbook–tomato juice, fresh lemon juice, prepared horseradish, but gets its spice from a homemade kumquat-chile paste,” Ted says. They have a recipe for it in The Lee Bros. Charleston Kitchen, but they stress that the best one is the one you like the best, so experimentation is encouraged. “It’s really in the acid/spice component that people can have fun with the formula: I’ve had ones with sriracha and ones with pureed kimchi,” so the sky’s the limit. Either way, homemade or poured from a bottle, Charleston’s love of the stuff goes way beyond garnish, and though I probably wouldn’t turn down an extra olive now and again, it’s all about what’s in the glass.